Is this the best form of golden sweet flag or what? 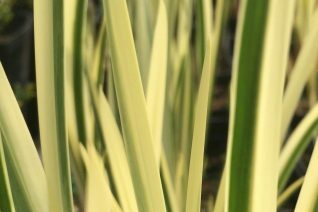 We love the vivid yellow leaves on a dense and arching evergold perennial. Clumps densely but the foliage is born in fans and spreads out. To only 6″ tall but spreading to 1′ wide. 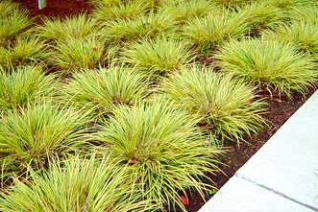 Best in part shade and either permanently wet sites or regular consistent water. Mine makes a happy home on the north side of my house at the base of the rain gutter. Plenty of water in winter- and I don’t forget to water it in summer. Good appearance year round. In spring little off-white spikes serve as flowers. Native to permanently wet sites. Give it a bit of shade. Moderately deer resistant.